The Scottish Government has been urged to take urgent action after a US celebrity hunter killed numerous animals on a recent hunting trip in Scotland. TV host Larysa Switlyk shared a series of posts on social media which appear to show animals shot and killed by herself and other hunters. Among the animals killed were two goats on Islay, as well as several stag and a ram in Highlands. Local MSP and Scottish Government minister Michael Russell took to Twitter to say that such practices should be “stopped immediately” and he would raise the issue “as a matter of urgency” with the Scottish Government’s environment secretary, Roseanna Cunningham. Scottish animal welfare charity OneKind said they were left “extremely shocked and saddened” by the images, which also provoked outrage from Twitter users in Scotland and beyond. One image posted on Switlyk’s Instagram account shows her posing next to a goat she had killed. “Beautiful wild goat here on the Island of Islay in Scotland. Such a fun hunt! !”, wrote Switlyk, who also asked followers interested in hunting in Scotland to get in touch. “They live on the edge of the cliffs of the island and know how to hide well. We hunted hard for a big one for 2 days and finally got on this group”, she added. “Good thing too because he could have ran off the cliff into the water”. Switlyk hosts a hunting TV show called Larysa Unleashed, which sees her travel to countries around the world to hunt animals. It is unclear whether her hunt in Scotland was documented for Larysa Unleashed. Switlyk also offers her own personally-hosted hunting trips and has a signature clothing range via a US sportswear brand. According to her website, Switlyk “wants to encourage the public, especially kids and females, to go hunting and experience the great outdoors. The purpose of Larysa Unleashed is, according to her website, “to enlighten and educate the general population about why people hunt and fish, the importance of conservation, cultural experiences, and the rules and regulations behind it all”. Sarah Moyes, a OneKind Campaigner, expressed dismay at Switlyk’s images of animals killed in Scotland. 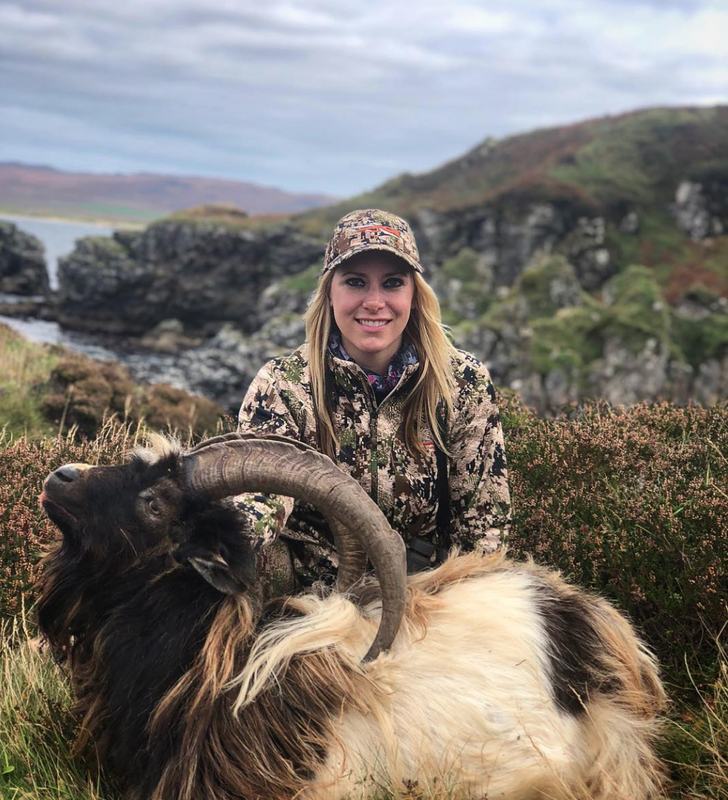 “We are extremely shocked and saddened by the images circulating on social media showing Larysa Switlyk and other hunters posing for photos with wild animals which they have killed on a recent trip to Scotland”, said Moyes. The Scottish Greens also condemned Switlyk’s killings and called on the Scottish Government to put an end “bloodsports” in Scotland. “Trophy hunting is sadly live and well in Scotland thanks to lax animal protection laws”, said Mark Ruskell MSP, the Greens’ environment spokesperson. “The Scottish Greens are completely opposed to bloodsports – we should be positioning Scotland as a world-leading destination for ecotourism rather than chasing after the custom of a small cabal of wealthy hunters who take pleasure from killing animals. The Scottish Government said that it supported sustainable land management, including the responsible culling of animals, but that the Environment Secretary will review current laws surrounding it in Scotland. “We fully understand why so many people find these images of hunted animals being held up as trophies so upsetting”, said a spokesperson. “Responsible and appropriate culling of animals is a necessary part of sustainable land management and the culling of some wild animals, including deer and goats, is not illegal. Larysa Switlyk has been approached for comment. This story was updated at 17.30 on 24 October 2018 to include a comment from the Scottish Government, and further updated at 18:19 to include an additional government comment.